There are certain games where the form book may as well be used to steady a table or rolled up to fashion an impromptu telescope to better see Wayne Rooney's impressive weave. Manchester United v Liverpool is unquestionably one such fixture, an infamously unpredictable one-off that has precisely zero respect for the weeks that precede it. What makes this Sunday's 198th grudge-fest even harder to call is that both teams are in imperiously fine fettle and have been for some time. 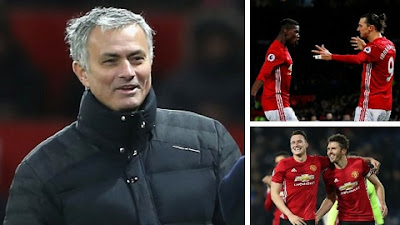 It's anything but a coincidence that United's ten game unbeaten streak in the Premier League has been accompanied by a belated gelling of Paul Pogba, Wayne Rooney and Zlatan Ibrahimovic as an attacking unit while Jose Mourinho has finally installed his patented force-field across the back-line. Liverpool meanwhile have the strong scent of a dream title in their nostrils and their Klopp-inspired magnificence can best be exemplified by the immense disappointment that followed their recent 2-2 draw at Sunderland. In previous seasons the Reds would have seen the value in that. Both teams then are flying high with confidence overflowing and the mandates laid down by their respective coaches in full working order. Anyone fancy flipping a coin? On the 34 occasions when these sides have locked horns since the turn of the century only four times has it ended honours even. Compare that with their respective derbies and it becomes evident that something occurs when the red powerhouses of the north meet that necessitates death or glory. The Manchester derby has finished as a stalemate six times in 31 games - and it's worth remembering that City were the outright underdogs for half of that time-frame - while the Merseyside equivalent has been drawn an astonishing 13 times since the millennium. Quite why this is the case is difficult to pin down as local affairs are certainly no less ferociously fought as the one divided by the M62. Thankfully we need not question the whys and hows, just avoid the draw. Liverpool are the second fastest off the mark this season requiring an average of 31 minutes - give or take a second or two - to find the net but this is Old Trafford against a Mourinho-marshalled defence in pristine form so don't let that put you off concentrating your attention on the second 45. 65.4% of the 81 goals since 2000 in this fixture have come in the second period and this is a game that often throws up late drama too - six times in 34 league games we've been collectively gob-smacked by a last minute goal - so don't be despondent if the clock is ticking and your bet is slipping away. If your instincts are telling you both teams will score be aware that only 47% of those 34 games has seen each keeper curse a missed clean-sheet, a figure that pales to the 54% so far in the Premier League this season. Balancing this out those 34 clashes have offered up 12 occasions when both teams have scored in the second half, a figure higher than the norm in fixtures that can be considered evenly matched. With early caution eventually giving way to tired legs and spaces the 21/10 for this to happen again is a serious tempter. Of the 81 Premier League goals this century has afforded us 30 were scored by a midfielder, which shouldn't surprise given the tight nature of the games often requiring a speculative effort or an unmarked run to break the deadlock. Recent history of this game has also thrown up some unlikely heroes including a whole litany of United defenders from Blind right the way back to a brace for Silvestre in 2004. With this in mind a fanciful punt on Valencia at 28-1 can't hurt. In fact why not go the whole hog and have Phil Jones at 50s. Should you be more inclined to favour the usual suspects Rooney has a habit of netting against Liverpool with six in total but don't rule out Daniel Sturridge adding to his previous three strikes in this fixture. At 13/2 Sturridge is terrific value when you factor in the anticipated change in system Klopp will employ due to injuries and Mane's absence. The 27 year old will be Liverpool's focal point and has recently looked close to his fit and firing best.